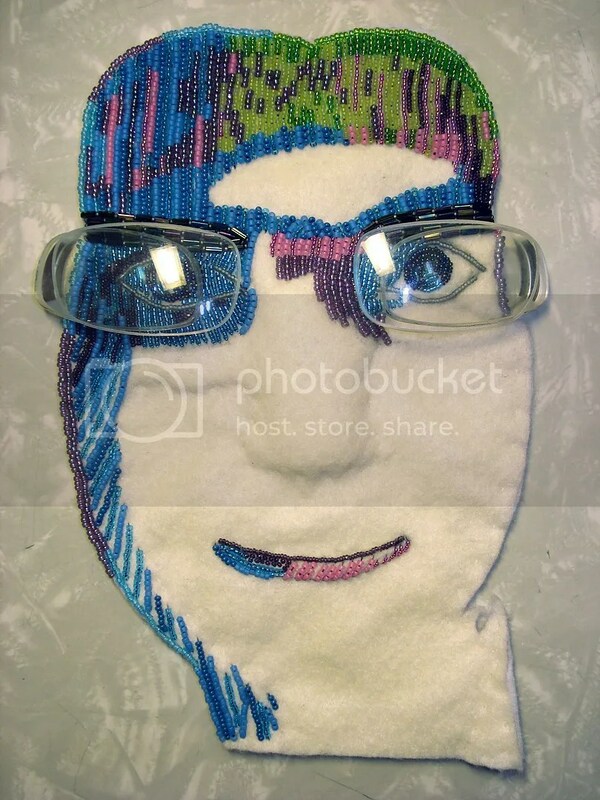 My beaded self portrait is slowly coming together. I still have a little more beading to do around the eyes, nose, and eyeglass lenses. At this point, it pretty much represents how I’ve been feeling lately. Blue. In addition to returning from Russia with some kind of respiratory ailment and serious case of the post-travel blues, I’ve also been feeling kind of lonely lately – missing close friends who have left and family who live far away… Most times, I feel all I can do is keep in touch via Facebook! I am also very sad that summer is slipping away… I guess if I just keep busy with beadwork and art, these feelings will pass eventually. What do you do to overcome these kinds of blues? Any suggestions are most appreciated! >Sorry to hear you're feeling blue. Going outside for a walk always helps me; it gets me out of my head for a while, and the fresh air just brings a better mood. You might also trying to find a little adventure — go to a neighborhood you like but don't visit very often, go window shopping at a store way over your normal price range, try a new beer or a new restaurant — anything that breaks up your routine. Or challenge yourself to put something positive out in the world. I love to find ways to have conversations with store clerks, or smile and wave at little kids when they are bored and waiting for their parents, or I put books back in the right section while I'm browsing at a bookstore or library. I hope you feel better soon. >Your work is quite impressive.. Hope you will feel better soon! >When you feel sad, it often helps to just make a smily face. Or make some grimaces. 😉 And it helps to go outside although the weather is bad (ok, when it's pouring and autumn storms are out there, you should not go outside ;)) and enjoy sun rays. Even through the clouds the sun can make you much happier than artificial lightning. Drinking green tea and staying away from alcohol helps as well! Additionally, making plans and thus creating things to look forward to is cheerful. I hope there is something among my suggestions which helps.